The picnic shelter on Alexandra Headland sits almost forlornly alone the week before Christmas, but today it will be a different story. The crowds will have descended, the early birds reserving it for the day, no doubt decorating it with balloons and tinsel, picnicking high above the beach for the entire day. On Boxing Day, the crowds arrive with a vengeance. Gorgeous looking vantage point whilst naked like this, Peter. Hope your yesterday was a good'un and now it is onwards and upwards into 2010. Thank you for your comment on my December Theme Day post of the kids looking in the Christmas windows at David Jones'. The next Theme Day is about "changes". Although the last quarter of 2009 was a series of cumulative changes for me, if you look at my Plumbing blog you will see another change coming for me during 2010. A neat photo with two challenges! 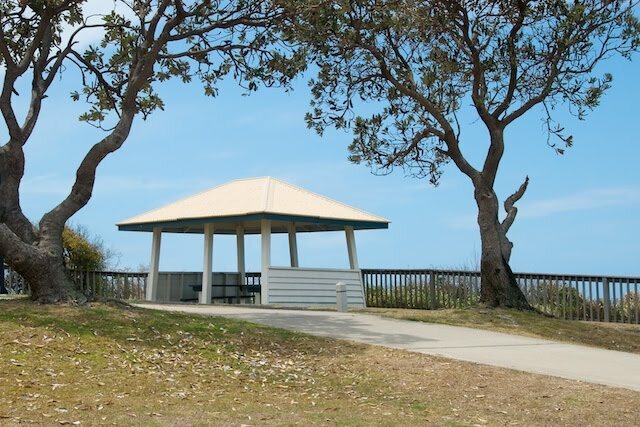 First there is the obvious lack of even a glimpse of the Headland view which must have some good features to warrant a well maintained path and picnic shelter. Then there is a contradiction between the technically challenging roof and the very basic supports and lower walls. Why not a flat roof for such a simple structure, or more elaboration at ground level to justify the roof design? An intriguing spot and shot!